← What Happened to Meru Mulika Lodge? Part three of Meru National Park’s demise, then revival as an exquisite tourist destination. Meru was at death’s door. Wildlife decimated from poaching. Meru Mulika Lodge in decay. Infrastructure almost non-existent. Then the French Development Agency (AFD) decided to monetarily assist the Kenya Government in restoring the park to its original splendor. 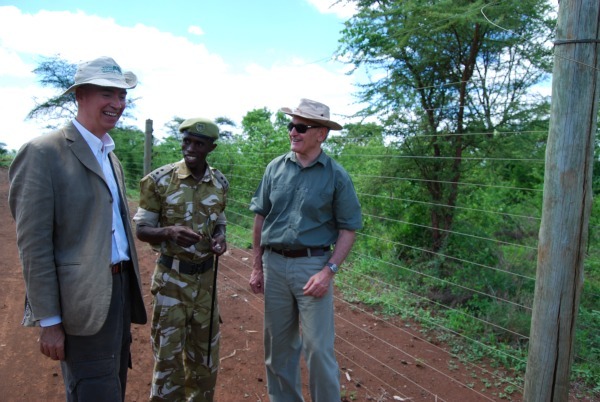 About two weeks ago, a French delegation including the French Ambassador, as well as officials from the Kenya Wildlife Service (KWS) toured Meru National Park to personally assess completed projects within the Park. Among the projects: an electric fence erected on the park’s western side to prevent wildlife from visiting various communities, new airstrips, new roads and tourism infrastructure. Funding also assisted in the purchase of 26 vehicles and community education. Once infrastructure was in place, the Kenya Wildlife Service got busy moving wildlife – 71 elephants, 54 rhinos, 15 leopards, 1376 Burchell’s and 24 Grevy’s zebra, 64 reticulated giraffe and 1427 impalas (per KWS figures). Eco-friendly lodges like Elsa’s Kopje, Rhino River Camp and Leopard Rock Lodge have been built, each so unique that it makes the “where-to-stay” decision difficult. Apparently, plans are in the works for additional luxury camps. But would added lodging be in the park’s best interest? Meru faces the continued threat of poaching and the bush meat trade, human/wildlife conflict and illegal grazing – issues that plague most of Kenya’s parks and reserves. Even with continued challenges the resurrection of Meru is a blessing, and for those who have the opportunity to visit Kenya – I hope you include Meru National Park. This entry was posted in National Parks and tagged Elsa's Kopje, Kenya Wildlife Service, Leopard Rock, Meru National Park, Rhino River Camp. Bookmark the permalink.